The National Medal of Science was established on August 25, 1959, by an act of the Congress of the United States under Pub.L. 86–209. The medal was originally to honor scientists in the fields of the "physical, biological, mathematical, or engineering sciences". The Committee on the National Medal of Science was established on August 23, 1961, by executive order 10961 of President John F. Kennedy. ^ John F. Kennedy (21 August 1961). "Executive Order 10961 Providing Procedures for the Award of the National Medal of Science". The White House. Archived from the original on 2007-08-19. Retrieved 2007-10-10. ^ AAAS Council (7 January 1979). "AAAS Resolution: National Medal of Science". American Association for the Advancement of Science. Retrieved 2007-10-10. ^ "2008 Call for Nominations through December 7, 2007". National Science Foundation. 24 September 2007. Retrieved 2007-10-10. 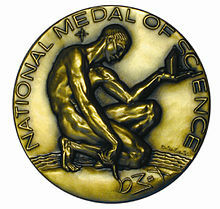 ^ "The President's National Medal of Science - U.S. National Science Foundation". National Science Foundation. Retrieved 6 July 2014. ^ "President's Committee, 2007". National Science Foundation. 15 August 2007. Retrieved 2007-10-10.